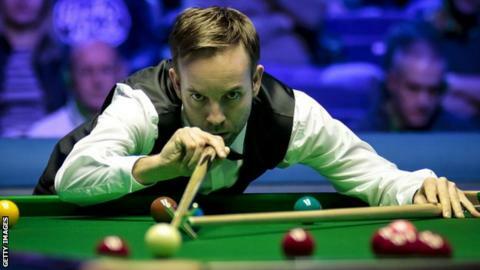 Ali Carter beat Jimmy White in World Championship qualifying to end the six-time runner-up's hopes of reaching the Crucible for the first time since 2006. England's Carter, a two-time runner-up, is one win away from the main draw after beating White 10-4 in the second round of qualifying in Sheffield. White did however surpass Steve Davis' record for most matches played in the event by making his 102nd appearance. Carter says he wants to face world number one Ronnie O'Sullivan, whom he beat in last year's second round, if he wins his final qualifying game to reach the Crucible. "I hope I qualify and I would love to draw him again first round," said Carter, who lost to O'Sullivan in both of his final appearances.